The Fullerton Real Estate market continues in the same stride from 2014. Home values continue to rise as inventory of homes for sale stay low and the demand from buyers stays strong. That being said buyers are no longer jumping at an open opportunity of a new home for sale. Today’s buyer will consider the home’s sales price as well as any deferred maintenance they will assume. A home priced right that is in great condition will sell quickly while one that is slightly overpriced and/or needs some work will sit longer and may need price adjustments. a healthy market, which, in and of itself, may feel like an odd sensation to real estate practitioners accustomed to the boom and bust of the 21st century. New Listings were up 17 percent for single family homes and up 17.1 percent for condos and townhome properties. Pending Sales increased 37.5 percent for single family homes but down 33.3 percent for townhouse-condo properties. 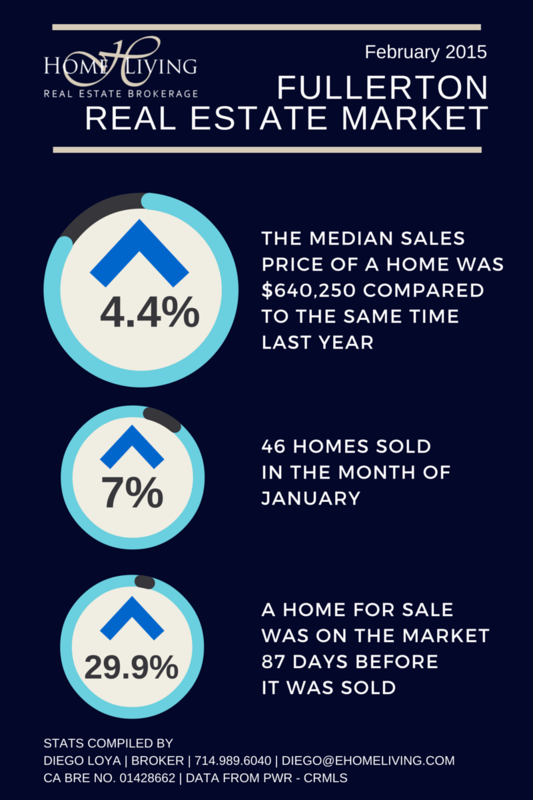 The Median Sales Price was up 4.4 percent to $640,250 for single family homes and down 24.3 percent to $280,000 for condos and townhome properties. Months Supply of Inventory was down, 2.4 percent for single-family homes and down 2.3 percent townhouse-condo units. rising along with extended daylight and buyer demand. These various economic pushes and pulls can turn stagnant markets into exciting ones. It’s all in how you look at it. *Data from PWR and includes Fullerton. (Contact us a specific type of property you are looking for) Homes are listed by newest to come on the market.